ANCHORAGE — Kenyada Waters was driving through town when she noticed a man on the side of the road. He was holding up a cardboard sign that read, “Laid off 2 long. Anything helps.” Waters noticed all of the cars in front of her drove right past him. Something in her told her to stop and hear his story. The man introduced himself as Richard and explained his situation. He told her how he’s been a tree-trimmer for nearly 20 years but found himself down on his luck after getting laid off. Richard said his cellphone was cut off because he ran out of money. Standing on the side of the road with a cardboard sign was his last resort. He told Waters that people would drive by him and yell out, “Get a job you stupid, lazy bum!” Richard told Waters that he had submitted over 20 job applications but since his phone was turned off, he wasn’t able to hear back. Waters says his story inspired her to help. She decided to pay for two months’ worth of cellphone service for him. “This man cried in AT&T!” Waters said. As soon as his phone powered back on, there was a job opportunity waiting for him in his text message log. “It might be you one day!” Waters wrote on a GoFundMe page she has set up for Richard. Andrew Moore lived alone and died alone. He was raised in an orphanage, never married and outlived his friends. For his last 40 years, the World War II veteran slept on a couch in a rent-­controlled efficiency apartment in the nation’s capital. The 89-year-old pensioner died in December with no will, no instructions and no next of kin. He lay in a cold room at the D.C. medical examiner’s office, where the unclaimed dead are usually destined for a nameless pauper’s grave. Instead, on Friday, Moore was given a hero’s sendoff at Arlington National Cemetery. A uniformed honor guard escorted Moore’s flag-covered remains. In place of a silent goodbye, a bugler played taps and three volleys of rifle fire marked his passing. How was a lonely man diverted from the oblivion of a potter’s field for the glory of his country’s most hallowed resting place? It was the work of a family Moore may not have known he had: the residents of State House, a post-WWII apartment building at the edge of Washington’s Embassy Row. His neighbors in that vertical village didn’t know much about the affable old-timer who smoked on the front steps. But they knew this: He deserved a dignified goodbye. Most residents of the eight-story, 308-unit State House probably never heard Andy Moore’s name. He was just one of the building’s fixtures, the friendly Redskins fanatic — always wearing the burgundy-and-gold cap — in Apartment 307. He would bring the staff members Hershey’s Kisses from his outings to CVS or cookies from the McDonald’s on 17th Street in Northwest Washington, where he would play pickup chess. It was Bill Sheppard and Nick Addams who spearheaded the effort to make Moore’s funeral something more than minimal. The two single retirees count themselves among the State House’s “sociables,” those residents who make a point to chat in the lobby, to pierce the urban anonymity of a busy city dwelling. Nick Addams and and Bill Sheppard attend the memorial service they arranged for their neighbor, World War II vet Andrew Moore, 89, at Arlington National Cemetery. Moore was a sociable, too. That’s how they pieced together bits of his history: a stint in the Navy, dispatched to the Philippines; a few years in the Coast Guard. He had worked at a federal warehouse and then for an insurance company, maybe as a janitor. For a man who loved to gab and could delay the mail carrier with a half-hour of football talk, he didn’t share much about himself. “We knew a little, but there were big gaps in it,” Sheppard said. He had no family, about that he was clear. He told more than one person that his mother was a Native American who dropped him off at a Catholic orphanage in Omaha. Boys Town confirmed that an Andrew Moore with the same birthday lived at the famous facility in 1942 when he was 16, but not for long. “We don’t know much, because he was only with us a month and then he ran away,” said spokeswoman Kara Neuverth. Moore was in his 70s when Sheppard moved to the building 15 years ago. Moore had a knack for putting strangers at ease, and the two struck up a smokers’ friendship outside the front door. Soon Sheppard was helping his upstairs neighbor make sense of the cable box. They watched a few games together, even though Sheppard is no football fan. “It was impossible not to like him,” Sheppard said. Moore’s health faded in recent years, as did his memory. He began to call Nick Addams “Calvin” for unknown reasons. “I just answered to it,” Addams said with a laugh. After a fall in 2014, Moore spent time in a rehabilitation hospital. Officials there had a court-appointed guardian assigned to him and wanted to move him to a nursing home. But Moore insisted on returning to State House. Moore came back with a walker, always asserting he would soon be done with it. He never walked unaided again, but he did live another eight months on his own. “This was his home,” Addams said. When an ambulance pulled up in December, Sheppard immediately thought of Moore. Sure enough, a desk clerk told him Moore had been taken to MedStar Georgetown University Hospital. A few days later, a manager told Sheppard he had died of heart failure. Sheppard and Addams were in the lobby, lamenting the loss of their neighbor. That could have been it. He wasn’t exactly a friend. They didn’t know much about him. It was city living; people come and go. But they kept thinking of two things: the Navy and the Coast Guard. Addams is also a D.C. tour guide, a retirement gig that has made him very familiar with the rites and rituals of Arlington National Cemetery. He knew that although it was hard to qualify for an Arlington grave, any veteran with someone pushing for him could have his ashes inurned there, with full military honors. It was an instant plan. Sheppard was the writer, drafting the appeal for funds they would hang on every doorknob in the building. Addams was the paper pusher, digging up Moore’s service record from the Pentagon, navigating the bureaucracies. Under D.C. law, unclaimed or indigent deceased are cremated at public expense and buried with multiple sets of ashes in a single casket. Veterans, when they are identified, are sent to Quantico National Cemetery. But after a 30-day waiting period, anyone willing to shoulder the expense of burial can arrange to have the body sent to a funeral home. Meanwhile, Sheppard’s solicitations were paying off. Envelopes began to slide under Addams’s door: $5, $20, a few $50s, one check for $250. In all, State House residents gave about $2,000 to honor a man some had never said more than hello to. The pair sent each donor a thank-you note and, when plans were complete, information about the funeral. They spent about $1,500 on the cremation, a cremation certificate, the death certificate. They will give the leftover money to a veterans group. They decided not to buy a special urn. Moore wouldn’t have cared about that, they said. So Friday, with a cool wind whipping across Arlington’s hills, the Stars and Stripes draped the cardboard box containing Moore’s ashes. 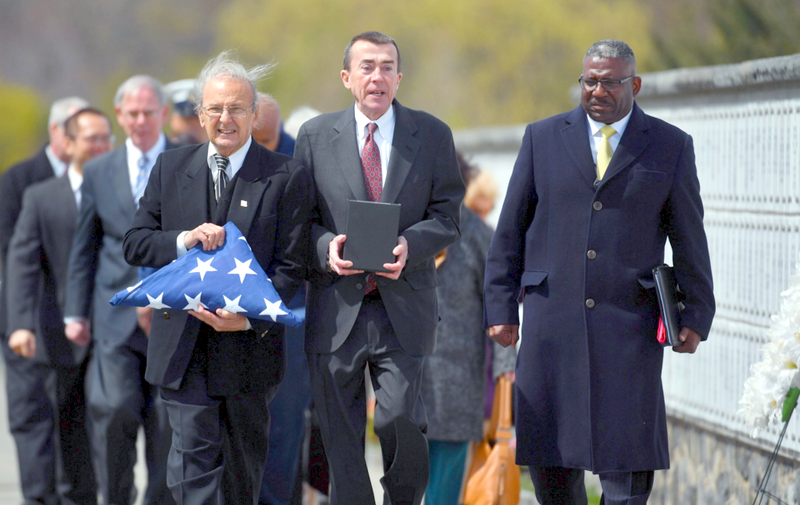 A Coast Guard honor guard folded the flag with grave precision before handing it to Sheppard. After the ceremony, Addams was given a felt bag containing the 21 shells fired in Moore’s honor. And as his neighbors — make that his family — looked on, a man who spent his life alone took his place for eternity amid a host of heroes. 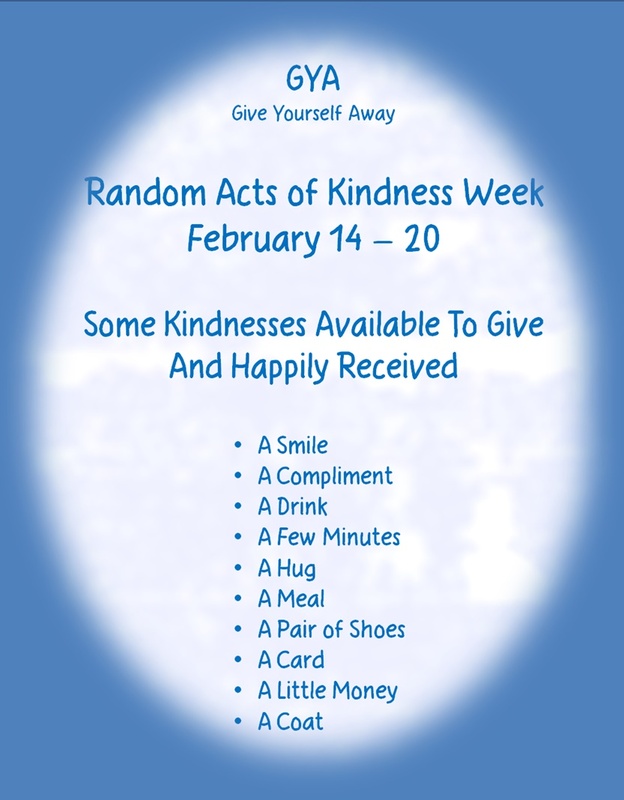 Here are six ways we can give ourselves away daily without cost. Beautiful words that are often attributed to Francis of Assisi, however the actual author is unknown. 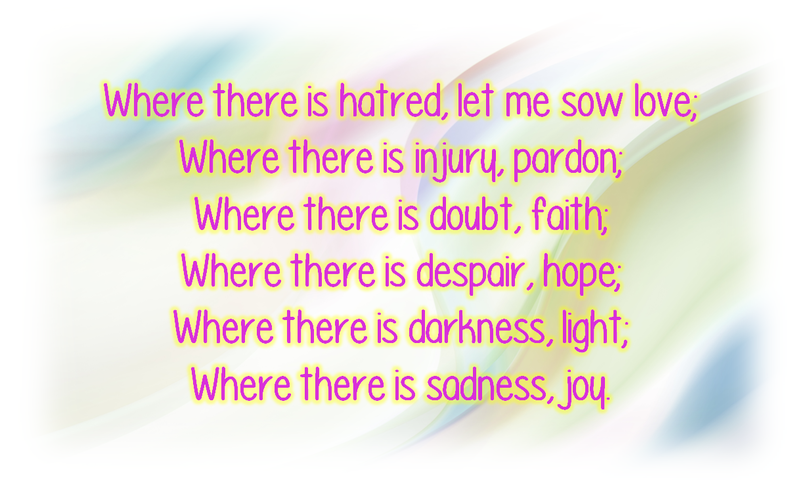 They first appeared in print over one hundred years ago as part of a prayer titled Peace Prayer. Our world is still in dire need of each. Please contribute today. Thank you.